There are many designs to choose from when you are deciding on a swimming pool. Whether your style is understated and minimalist, modern and sophisticated or classic and elegant, No Limit Pools can help you construct the pool of your dreams. 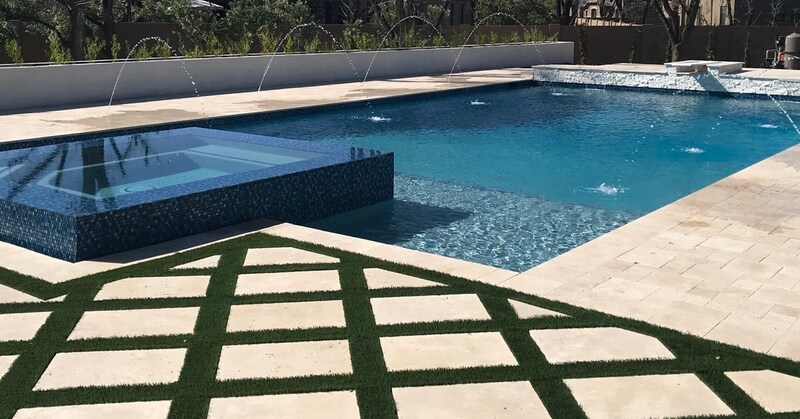 Free form pool shapes are trendy now, and the No Limit team can assist you in finding the natural or freeform pool that suits your yard and sense of style. A freeform pool is designed in an irregular shape or style with a flowing line. If you want to give the freeform pool a contemporary look, talk to your No Limit Pools consultant about waterfalls or rock structures to add to the pool space. These features provide the pool with a nature-centered look that resembles a lake or pond. In most cases, freeform pools are made from concrete or vinyl. At the start of the construction process, a hole is excavated into your yard and the framework is stabilized. Then, concrete is poured into the pool space to create the shape and size you want. If the pool is lined with vinyl, you will have a bit more freedom when you are choosing the pool shape and design. How Did Freeform Pools Become a Trend? The first freeform pool was constructed in California. One of the first models was built as early as 1920 and was erected above a tank with a synthetic shore on one side. Early freeform pool models also featured landscaping around the pool to make the pool look like a small beach or lake. Several freeform pools have rounded corners to resemble a natural body of water. You can also work with your contractor to add real or synthetic plants around the pool to make the pool look like a tropical oasis. Stone or concrete designs around the pool also emphasize the shape of the pool and allow you to customize the outdoor space. An artificial shore is also a great way to accent a freeform pool; using a combination of small stones and sand to accentuate the shore to make the area look like a beach. You can also work with your contractor to have seating installed around the pool. The seating feature makes the pool area look like its part of a resort. To complete your freeform pool design, speak with your contractor about a fence or barrier that will surround the pool. This keeps the pool area safer and decreases the chances that your children or pets will get into the pool without your supervision. You can also add a fountain or fire bowl to the pool area. These features make the pool site exceptionally elegant and are a great way to show off your style. Adding a pavilion, customized seating, and a waterfall inside the pool area ensures that your freeform pool space is one of a kind. If you have a larger pool and want to add a freeform section of the pool, your contractor can work with you to let you know which renovations would be best. No Limit Pools takes pride in serving the Phoenix AZ area of Chandler, Gilbert, Mesa, Grand Canyon and beyond. Use our contact form to get in touch with us and set up a consultation. When it comes to Arizona pool builders, No Limit Pools is your best choice due to our commitment to quality and years of experience. We are happy to answer all your questions about pool construction and help you narrow down your design choices to ensure you are delighted with your new pool. If you already have a pool in your yard or want to enhance your existing pool, a waterfall is a great idea. Whether you prefer a Tahitian waterfall or want a pool with a rock waterfall and slide, No Limit Pools can walk you through the construction process and provide design inspiration. Here are a few construction tips to ensure that your new waterfall is one of the best parts of your new or renovated pool. When you are building a waterfall into pool spaces, the shape, and size of the waterfall need to coordinate with the rest of the surrounding landscape. If you want the waterfall to look as natural as possible, do not build it too high if the rest of your yard is flat. The waterfall will appear more natural if a small hill or ledge is formed around it. Be sure that the size of the waterfall matches the size of the pool and the size of your yard. A waterfall that is too big will take up too much space and may look overwhelming. If the waterfall is too large, you may not be able to swim the full distance of the pool comfortably. Whether you’re building a rock waterfall pool structure or want the waterfall to have a more abstract appearance, it’s best to construct the waterfall close to an electrical outlet in your backyard. The waterfall skimmer, in particular, should be near an outlet. The skimmer sends the water back to the top of the waterfall so that the water will flow down the waterfall structure. Skimmers need electrical power, and if the skimmer is no more than 10-12 feet from an outlet, so the skimmer cord will not run across your yard. Financially it will be better if the waterfall is not constructed in an elevated section of your yard. Your water pump will have to work harder if the waterfall is uphill, which means you will be using more gallons per hour. 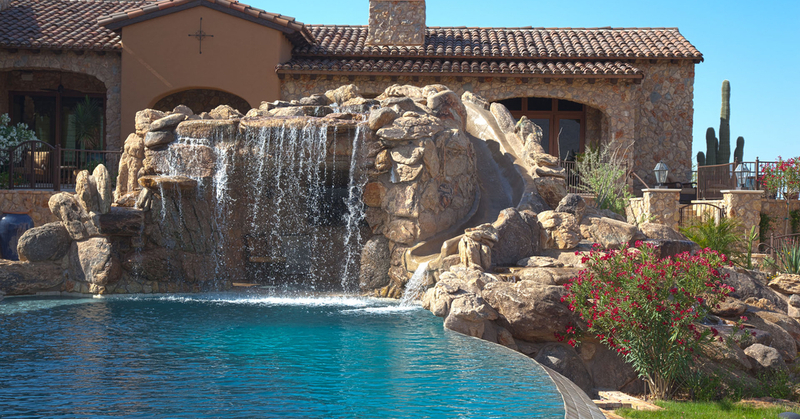 A waterfall on level or slightly elevated ground could save water and help you stay within your pool maintenance budget. Talk to your contractor about getting a quality water pump that is easy to read and operate, so you will know how much water you are using. Whether you already have a pool or are considering constructing a pool with customized features, a waterfall can bring your backyard aesthetic together. Swimming pool waterfalls construction can add texture and structure to the pool, and you can add plants and tropical flowers to make the pool look like its part of your favorite resort. That is why No Limit Pools is here to help you find the pool waterfall that is perfect for your outdoor setting. No Limit Pools is a swimming pool contractor Phoenix AZ servicing Mesa, Chandler, Gold Canyon, Gilbert and beyond. We have the tools, resources, and expert builders you need for a beautiful waterfall that will make your pool more attractive. No Limit is a pools company that has been in business for years. We know what it takes to construct a pool that is safe and fun for your family while providing value to your property. We are happy to answer all your questions and to show you our previous work to provide design inspiration and the assurance that you will get quality results. Contact No Limit Pools for additional information regarding swimming pool waterfalls construction or our other pool builder services. Unique landscape and design is an important part of making your pool space come alive. The outdoor area is just as much a part of your property as your actual home. This means that you can be creative and design a pool area that is just as comfortable to spend time in as the inside of your home. Are you looking to have an amazing pool with an amazing landscape in your backyard? No Limit Pools can assist you in creating a tropical, trendy, modern, classic, or welcoming space that you will absolutely love. Your landscape design could depend on several factors. The shape of your yard, the plants that are currently grown on your property and the amount of space you have to work with can all determine the final product when it comes to landscape design. For instance, our construction team will work around the colorful flowers or large trees in your yard to build steps or a deck that will lead to the pool area. 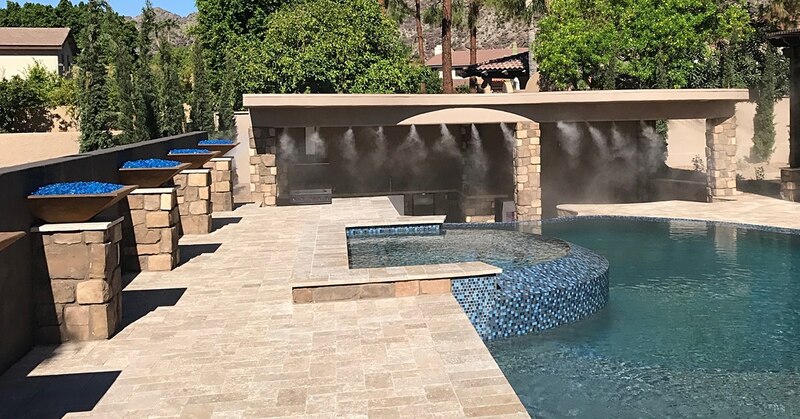 Whether you want to use treated concrete, stone, brick or fiberglass, No Limit Pools will provide more information on each of these materials. We will also provide recommendations on the plants and features you can add to the yard to complete your pool area’s design theme. Since a number of lawns and yards in the Phoenix area do not have much grass, you can work with your pool contractor to great a rock garden or a Zen area with sand and fountain structures. You can also have the area around the pool paved so that there is enough space to install permanent seating around the pool. Large rocks, stone structures, fountains and brick structures for plants and shrubs can also make the pool area look more appealing. We also know how to clear the patio or deck area and replace the flooring or covering to coordinate with the pool. This area is great for adding outdoor appliances like a small stove or refrigerator. If you have enough room, your contractor can also work with you to create a permanent table and chairs on the deck. The outdoor furniture can coordinate with the pieces you have inside your home, or you can choose a totally new design theme. The landscape also entails building structures in or near the pool area that make the space more unique. You can have a slide or ladder built into the pool so that you will be able to enter and exit the pool easily. On the other hand, you can request that a waterfall is built into the pool space to make the area look like a resort. When you are ready to make significant changes to your backyard and have a swimming pool built, No Limit Pools can inform you about the entire process. Your yard will have to be accurately measured. Your soil and lawn will also be tested to see if there are any shallow or deep areas that should be avoided or adjusted during construction. Once the areas of construction have been clearly outlined, the construction team will start the excavation process so that your pool vision will become a reality. Use our contact form to get more information about building the perfect pool on your property. Let our team know about your preferences and budget details. This will give us the information we need to put together the ideal pool construction plan for you. Be sure to ask any questions you may have and depend on us to explain every part of the pool building process, clearly. Browse our website to view our completed projects. Choose No Limit Pools for your new pool and landscape design project. The outcome will be beyond what you could have ever imagined! No Limit Pools is one of the premier pool builders AZ has to offer. We are committed to making sure that families have the pool of their dreams. We understand that building a new pool can be stressful. We know there is much more than just the pool build. There are additional features as well as landscaping. A beautiful landscape can help to bring out the best in the pool. If you want to know more about the pool building process, additional features, and landscaping you are in the right place. Here are some of the reasons why. We know that the pool is an important part of your outdoor space. That is why it is important to make sure the pool is just as appealing as your actual home. Pool borders, permanent seating, tables, and even decorative features like fountains and fire bowls can make the pool area one of a kind. A fountain or fire bowl makes the pool area especially elegant. These features are great for adding texture to the pool space. The right contractors will build fire bowls and fountains that are made of the same material as your home. Alternatively, you can go with an entirely different decorative scheme. Choosing a variety of bold or understated colors can emphasize the pool area. If you do not have lots of grass in your yard, you can even utilize landscape ideas like rock or sand gardens around the pool. This could make the pool area especially tranquil. Landscapes are a huge part of the pool building process. The finished product can give you an outdoor living space that is perfect for entertaining guests. Our team works with you to designate certain parts of the yard for a table or chairs. You will even get all the details you need to build a kitchen area outside near the pool. Our contractors can provide you with great ideas for adding a stove and cabinet area so that you can spend hours outdoors and prepare meals in between spending time in the pool. No Limit Pools has an unlimited amount of landscaping design ideas for you to choose. If you prefer rustic décor in a natural setting, the Primrose design scheme may be best for you. The Skyline design collection has a modern flair that will make you feel like you are on vacation every time you go to your pool. If you prefer brick and stone in a variety of colors, along with pillars and circular features that highlight the pool and fountains, ask our team about the Moline design scheme. No Limit Pools can also completely customize your pool area according to your specifications. Whether you want to add a water slide to the pool or include a basketball hoop (or both), we have got you covered. Once we measure your yard and evaluate the shape of your property, we can suggest the most creative and practical designs to plan and build the pool you have always wanted. When you are ready to have your pool constructed or updated, use our contact form to tell us what your needs are. We will schedule a consultation for you so we can understand exactly what you want in your new pool. We know that your pool could be a great place for you and your family to create beautiful memories. That is why we will do our part to ensure that the premier pool and pool landscaping is a safe and visually appealing place. It will add value to your home and allow you to host fabulous get-togethers. Get in touch with us today for more details. 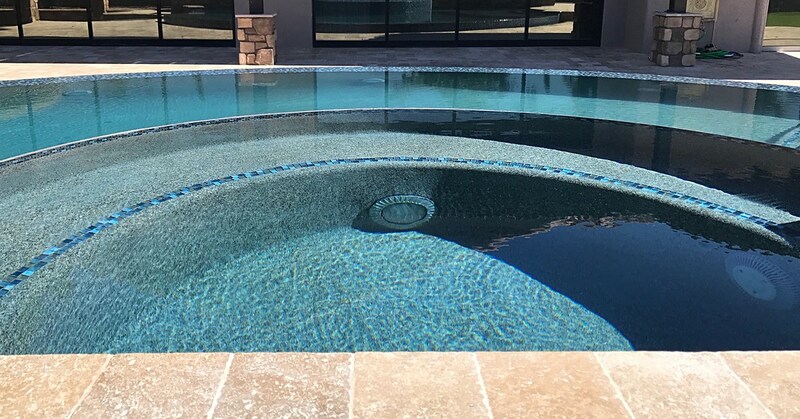 We build new pools with awe-inspiring features and pool landscaping throughout Phoenix, the surrounding areas of Mesa, Chandler, Grandcanyon, Gilbert and beyond. 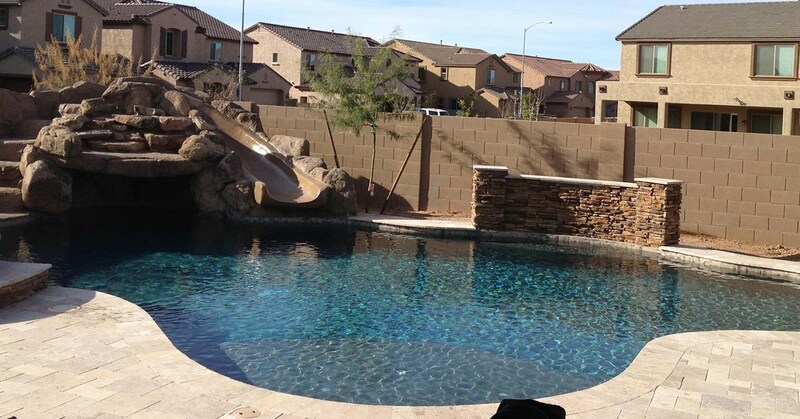 If you have been a long time resident or have just moved to the Phoenix area and are looking for Phoenix pool builders, you can trust in the team at No Limit Pools. As a long time Phoenix Pool Contractor we understand that a pool is a huge investment. A pool on your property can increase your home’s value. The pool also provides an attractive place for friends and family to gather outdoors. Whether you are teaching your children to swim, want to do water aerobics a part of your workout routine or simply want to feel like you are taking a mini vacation when you step into your backyard, No Limit Pools can provide everything you need to bring your vision to life. 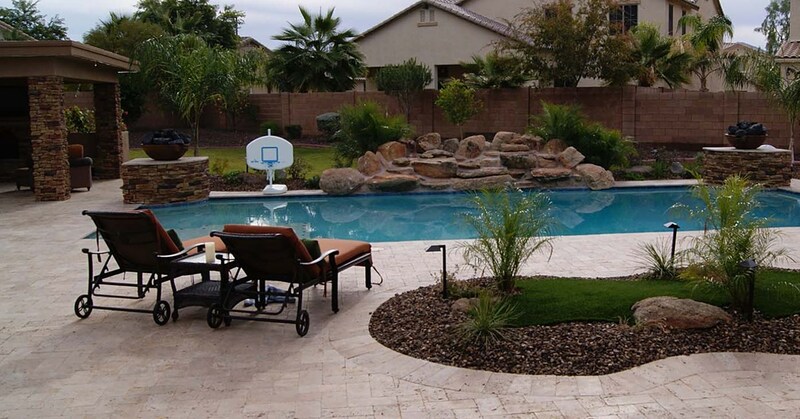 Our Arizona pool builders will assist you in finding the right shape and size for your pool. This is based on the shape of your yard, how much space you have to work with, and the primary use(s) for the pool. If you have certain colors or materials in mind, the No Limit Pools team will recommend the best hues and materials for you based on your overall design vision. For instance, if you want a pool space that coordinates with the brick or siding of your home, we can provide pool borders and accents in the same color scheme. If your home and outdoor space have a modern or minimalist feel, we will construct an invisible pool or a pool shape with defined lines that will complete the overall look of your property. We are one of the best pool companies AZ provides because we will explain each part of the pool building process with you. We will have to measure your yard and mark the place where construction professionals will dig the pool area. Your soil will also be evaluated to determine where the pipes and drainage features of the pool should be positioned to ensure there are no plumbing issues on your property. Once space is dug for your pool, the pool floor and border are installed. 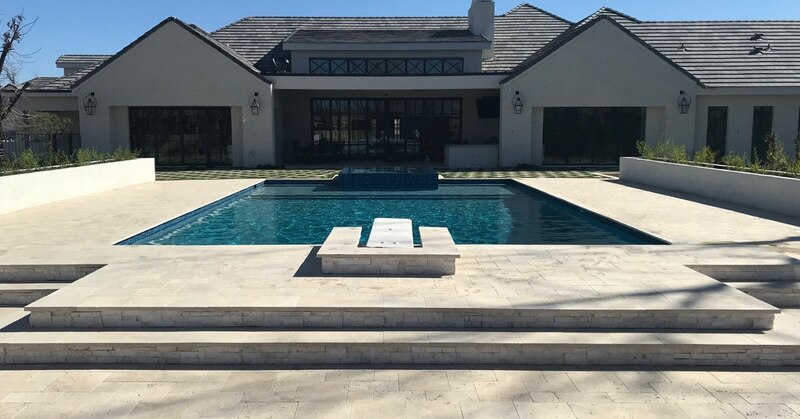 We will also work with you to select the right stone, concrete or fiberglass for your pool space based on the type of pool maintenance with which you are comfortable. Each of these materials provides a different design aesthetic based on your preferences. We can also add features to the pool like an invisible entrance that looks like the shore of the beach. You can also ensure that one part of the pool is shallower than the other if children will be in the pool often. Other safety features like slip-proof material on the borders of the pool or ladders that lead into the pool can also be added to the pool to keep you and your loved ones safe. If you want to add more features to your pool area, let the Phoenix Pool Contractor team at No Limit Pools know. We will let you know how to add paving to your porch or deck area so that you can include tables or outdoor kitchen appliances in the backyard. You can also add fountains and waterfalls to the pool area that match the materials you have used for the actual pool. 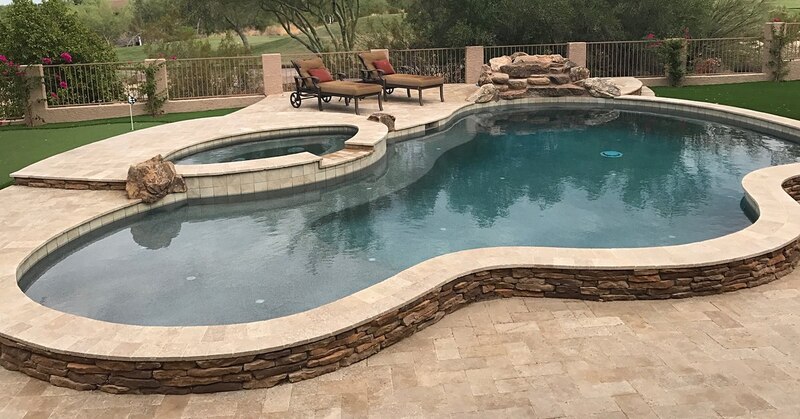 We provide some of the best pool contractors Phoenix AZ has to offer, and we are happy to answer all your questions throughout the pool building process. Be sure to visit our website for design ideas and use our contact form to get in touch with us and schedule your consultation. We look forward to helping you design and build the pool of your dreams. If you are seriously considering getting a new pool, it is important to know the difference between a salt water pool and a chlorine pool. Chlorine and salt water are the two main choices for pools, although it may be possible to have a combination of both substances in the pool water. For instance, salt-water pools do contain chlorine. However, the chlorine is produced through osmosis. Chlorinated pools have much more chlorine and the chemical is not natural, so you will have to add more chlorine as needed. There are advantages and drawbacks to having both types of pools, but this guide will help you determine which choice is best for you. Salt-water pool vs chlorine health is a huge concern for several potential pool owners. Pools with salt water do not have caustic chloramines in this, which means that you will not experience reactions like itchy skin and red, irritated eyes. Salt-water pools also will not bleach your swimsuits, and you will not experience the harsh odor that often comes from chlorine. Are Salt Water Pools Cheaper? When you are thinking about salt-water pool startup, the price is usually a determining factor. Initially, you will pay more for the pool. A salt-water pool is more complex to set up than a chlorinated pool, so it is best to have a professional do the salt-water startup for you. You should also ask about certain pools and underwater lights since some of these equipment pieces could be corroded by the salt. Since the system for a salt-water pool works well with the pool equipment you already have, you will end up saving more money when it comes to maintenance. Salt-water pool systems work with a variety of pool pumps as well and automatically activates the pump on a daily basis to keep the water clean and appealing. These types of pools have been around since the 1970s and have been proven to keep the pool water safe and sanitized. You can use one salt water system to provide you with hundreds of pounds of pure chlorine in one year. Chlorine pools usually require more maintenance. You will have to test the water regularly and add chemicals as needed. If there is too much chlorine in the pool, it could cause allergic reactions. If there is too little chlorine, algae, and mildew are more likely to develop in the pool. Salt water has healing and therapeutic properties. This is why some individuals with joint pain or swelling choose salt-water pools. The salt has the ability to draw moisture from the body, which can help with conditions like edema. Salt-water pools only produce chlorine from the salt cells when necessary. This makes the water in salt-water pools softer than the water in chlorinated pools. Salt water is gentler on the skin and can even promote circulation. It is also easy for you to maintain the saltwater pool yourself as opposed to always having to call a professional. This cannot only save you money but increases the chances that you can maintain the pool according to your schedule. The salt in the pool is also so minimal that you should not taste salt in the water. However, the salt is effective enough to clean the water and prevent impurities from developing in the pool. Use our contact form to get in touch with one of our No Limit Pools team members when you are ready to build your new pool. View our website and our gallery to see our work and get an idea of what we can do for you. We will be happy to answer any of your questions and set up a consultation appointment. If you’re considering a pool remodel, there are several factors to keep in mind. While you may have an idea of how you want your new pool to look, you’ll also have to think about the function of the pool. Pool remodeling can be a detailed process, and sometimes the remodel can be similar to getting a brand new pool. However, there are some minor adjustments you can make to your pool space that will make a huge difference. That’s why No Limit Pools is here to help walk you through it and ensure you get the best pool for your style and needs. Adding lights to your pool is a fairly easy way to increase the visual appeal of your pool area. LED lights are the ideal choice when you want to add in-pool lighting. The lights are energy-efficient and provide enough luminosity to light large pools. You can even program the lights to change colors. The hues can match the overall décor of your home. You can also coordinate the light colors with the shades of your garden or shrubs. There are special processes and equipment that are necessary to install the lights inside the pool. No Limit Pools has a team of professionals who can handle this job for you quickly and efficiently. After some years, it may be necessary to resurface your pool. This can not only improve the way the pool borders and floor look but can make the pool area safer. You can choose from a variety of materials that remain cool in the heat and are slip-resistant. This process will require having your pool drained. The old surface and surrounding areas of the pool will be removed and the new surface you choose will be applied. You can even have special surface tiles applied around the pool that glow in the dark. Many of these are eco-friendly and powered by the light of the sun. Once the tiles have been exposed to light all day, they will glow at night, sometimes for up to eight hours, depending on the type you choose. Adding a firepot to your pool space can instantly make the area more elegant. The structures can make it easier to see around the pool at night and add more texture to the pool area. You can add more than one firepot to make the pool setting especially relaxing. A professional contractor will position and secure the firepots so that they are a safe distance from the pool. This may include stonework or pool coping to make sure the border and pedestal for the firepot work for your pool size and shape. Combinations of stone and metal materials are available for firepots. You can choose designs that feature small pots within a larger pot. You can also work with your contractor to select the right colors for your firepot that will coordinate with the pool. Contact No Limit Pools when you’re ready to remodel your pool. We service the surrounding areas of Phoenix including, Chandler, Gilbert, Mesa, Grand Canyon AZ and beyond. We understand that you’ll have questions and may not know which resurfacing, lighting or structure upgrades are ideal for your pool area. Our team is happy to help with complete pool remodeling in Chandler and the entire Phoenix, AZ area. When you contact us for services or a consultation, we’ll visit your home and evaluate your property. This will let us know which remodeling projects will work well on your property and which processes are safe for your pool space. We’ll walk you through the remodel process to let you know which features would be best for you. Getting a pool in your yard is a huge yet exciting investment. Whether your style is more traditional or you prefer modern design, there are lots of pool options to choose from. A good professional pool builder can work with you to design the perfect pool type as well as incorporating the right materials based on your needs and sense of style. As you’re searching through swimming pool designs and plans, there are a few things to consider. Thinking about the layout of your property, as well as the people who will be using the pool, will help you choose the right swimming pool design for your home. Below we list a few 2019 pool design ideas to help you get started. Traditional pools have a rectangular or square shape. However, one of the trends for 2019 is the circular pool. This is a great idea if you want your pool to look more like a spa or hot tub. A circular pool is also ideal if your lawn space is limited or you want to leave room for an outdoor kitchen or sitting area. The pool border can be made of stone or glass mosaic to give the pool a relaxing, resort feel. Other backyard pool landscaping ideas include pools with negative edges. Even if you want a rectangular pool, you can round the edges or add fancy designs to the perimeters. This design is similar to the ones you’ll see at fancy hotels. So, you’ll feel like you’re on vacation every time you step into your backyard. This pool design also makes it easier to add small fountain fixtures around the pool. This adds to the elegance of the design. You can even program the fountains to add warmer water to the pool if you enjoy swimming during the cooler months of the year. Fiberglass pools are great for providing the illusion that you’re stepping into the ocean or entering the water at the beach. The sparkling glass makes the blue of the water even more evident and makes the pool look more inviting. If you prefer the infinity pool design, fiberglass is a good choice. With an infinity pool, the water flows seamlessly from one part of the pool to another. Fiberglass pools look especially appealing with shiny colored tiles bordering them. Or you can choose a glass mosaic design to add more color to the pool space. After you’ve chosen the pool design you want, you may want to create a coordinating patio. The patio can simply be used as a border for the pool. Or, you can enlarge the patio space so that your family and friends can relax there in between swims. Concrete materials that are comfortable to walk on are ideal for the patio. It’s also best to choose materials that aren’t susceptible to water damage. Cobblestone or fiberglass borders for the patio will make the entire pool area appear more uniform. These elements can also be added to wall borders or columns in the patio area. If you’re also building a kitchen or sitting area, you can work with your contractor to add design elements to your outdoor appliance that match the pool. Contact No Limit Pools to meet with our qualified team. We serve the Chandler, Gilbert, Gold Canyon and Mesa Arizona areas, as well as Phoenix AZ. We’re happy to assist you in finding the perfect pool design and can walk you through the building process. As the premier Phoenix pool builder, we have high-quality products and methods to make your vision come to life. We’ll also provide you with the tips you need to keep your pool looking its best. At No Limit Pools we keep up with the hot new trends and are passionate about the new 2019 pool design ideas our team has to offer you. If you enjoy swimming in your pool during super hot sunny days, you’ll need to know how the sun reacts with the chemicals in the pool. Taking a dip in the pool on a warm day is a great way to relax. You may not have to worry about the cleanliness of the water if the pool is properly chlorinated. Chlorine keeps bacteria and algae from growing rampantly in the pool. Chlorine also maintains the color of the pool water; it keeps it from turning green. The sun can affect the way chlorine works to purify your pool water. That’s why it’s important to know how to care for the water so that it’s safe for you and your family. Does Water Temperature Affect Chlorine? The temperature of the water in the pool affects the way chlorine is broken down in the pool. When bacteria in the water proliferates, free chlorine is consumed at a faster rate. If the water temperature is too high, you could scald your skin when getting into the water. Ideally, the temperature for spas and hot tubs shouldn’t be more than 104 degrees. The pool water temperature should be between 78 and 82 degrees for chlorine to function effectively. What Does the Sun Do to Chlorine? There are two types of chlorine present in the pool: free and combined. Free chlorine is a fraction of the chlorine used to shield the water from infection and bacteria. Free chlorine is lost when it comes in contact with sunlight. Free chlorine is also lost when bacteria reacts with it. Free chlorine is formed when the chlorine forms hypchlorite ions. The hypochlorite separates when UV light hits it. This turns the hypochlorite into gas, which is released into the air. When humans or animals are in contact with too much chlorine in the air, breathing difficulties may occur. Combined chlorine is the portion of chlorine that interacts with bacteria and algae. When there is too much combined chlorine in the pool, it may be a sign that your pool is getting too much sunlight. The sun makes the chlorine less active, and more foreign invaders are able to fester freely in the water. However, the free chlorine is what needs to be replaced when you re-chlorinate your pool. When your pool reaches less than one part per million, the pool is not safe for swimming. Re-chlorinate the pool. UV rays oxidize the chlorine in the water. This causes UV light chlorine degradation. Chlorine is the chemical used most often to treat and prevent bacteria in the water. This makes it a necessary component for your pool water. However, chlorine is very reactive and has a very strong smell, which is why you can’t put too much in the water. When the chlorine level is too high, it can also cause corrosion on parts of the pool. Sunlight degrades chlorine to the point where it is not as active as it’s supposed to be. This is why it’s best to build your pool in a part of the yard that doesn’t get direct sunlight. You can also choose to set up your pool or hot tub in a shaded area to limit the amount of sunlight that comes in contact with your water. Contact No Limit Pools to learn more about pool care and choose a pool that is right for your property and budget. We are currently servicing Chandler, Gilbert, Grand Canyon, Mesa, AZ, and surrounding areas. Our qualified team of experts can evaluate your property to make the best pool recommendations. You will also get professional advice for your pool or hot tub. We will help you keep it looking great and functioning at its best for years to come. If you live in or near the Mesa, AZ and have had a pool for a few years, you may be looking to resurface your pool. Choosing the right pool surface materials can make a big difference in the safety of your pool and the length of time it will last. There are a number of issues to keep in mind when deciding on resurfacing so once you’re ready to have your pool resurfaced, here are some tips to keep in mind. The finish of your pool can become damaged if the water chemistry is not balanced. The sun can also cause wear and tear on your pool’s surface. Before you have your pool resurfaced, you should purchase a test kit. This is used to test the chemistry of the pool levels, so you can share the details with your contractor. Your contracting team will likely also test the water to see which materials would be most durable for your resurfacing. It may also be helpful to test the water several times before the resurfacing and share the details of the different readings with your contractor. This will make it easier to choose pool materials that won’t corrode or rust when they come in contact with your pool water. As soon as you notice a part of your pool that needs to be repaired, take care of the problem as soon as you can. Ignoring damage can make the problem bigger and more expensive. If there is significant water damage or corrosion, it may cost more to have the pool resurfaced. If you notice damage in your existing finish, make an appointment with a contractor right away. These damages can cause leakage. The leakage can lead to erosion issues for the structures in your yard, including decks, and porches. A number of pool contractors are no longer offering plaster finishes. This is largely because the plaster will only last up to 14 years. For some pools, the time is even shorter. Your contractor may suggest a pebble surface for your pool, especially if you’re not sure which material you want yet. Pebble surfaces are increasing in popularity, but you can also select a finish that is made from glass or quartz. Pebble finishes are also more affordable than other surfaces, which makes it ideal for a specific budget. Even though it may seem logical to simply patch up the part of the pool that is damaged or leaking, this is only a short-term solution that may not be effective. It’s pretty safe to assume that if one part of the pool is corroding, other sections will start to become damaged as well. The patching also doesn’t ensure the new patching material will adhere securely to the old pool surface material. The weak adherence may mean you’ll have to patch the area more than one time. Poor patching also means that leaks can easily get through; which can cause more damage. Once you see an area or two of your pool surface that needs repair, it’s best to have the entire area resurfaced at one time. Is It Time For Pool Resurfacing? Contact No Limit Pools when you want one of the best pool builder companies Mesa, AZ has to offer for your pool installation, remodels and resurfacing. We service Phoenix and the surrounding areas including but not limited to Mesa, Gilbert, Chandler, and Grand Canyon AZ. Our company provides Arizona pool resurfacing at affordable prices. We use quality equipment to ensure the job is done right. We have built a great reputation with the pool resurfacing Phoenix areas and pool remodeling in AZ. Feel free to contact us to find out more about our company and to see reviews and feedback from our 100% satisfied customers.